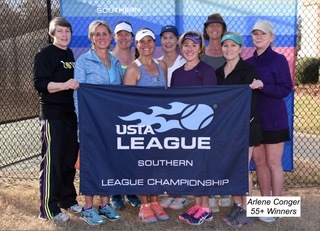 MOBILE, ALA. – March 12, 2018 – USTA Southern crowned 18 champions at the 2017 18 & Over and 40 & Over Combo Doubles Southern Sectional Championships, played March 9-11. 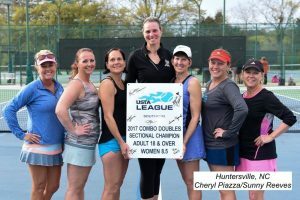 North Carolina had an outstanding tournament with eight champions and three finalists, far outdistancing other states.The annual championships were played at the Copeland-Cox Mobile Tennis Center (tournament headquarters) and Cottage Hill/Medal of Honor Park. 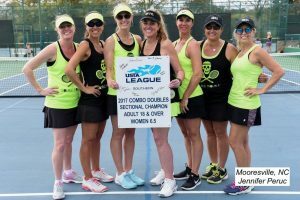 There were 159 men’s and women’s teams with more than 1,500 players from nine states. More information can be found on the tournament’s website, www.SouthernChampionships.com. 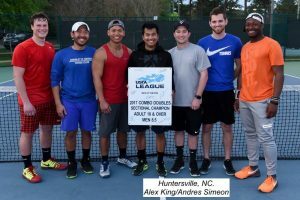 Congratulations to these Lake Norman teams for bringing home the win!